The Throughbred Rehabilitation Centre will be playing host to a demonstration by champion equestrian sportswoman Lucinda Fredericks. The lecture demo evening will be held at The Throughbred Rehabilitation Centre, Whinney Hill, Aughton Road, Halton in Lancashire on the 10th April 2014. 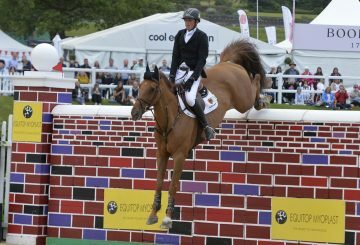 Lucinda, a star of the equestrian world, will be delighting the audience with a display of the talent which has enabled her to reach the highest echelons of three-day eventing. Many will remember her victories at elite four-star events Burghley and Badminton in 2006 and 2007 respectively, aboard the awesomely plucky little chestnut mare Headley Britannia. Lucinda has ridden and won at Grand Prix level and also competed at the Olympic Games in Beijing 2008 and London 2012. Don’t miss this fantastic opportunity to learn from a champion rider in the superb facilities at The Thoroughbred Rehabilitation Centre. You will see Lucinda work her own horses at different levels proving that Lucinda can work her magic at all levels! The demo is being held at 7.00 pm on Thursday 10th April , with doors open from 6pm. Tickets are £20.00 for adults or £14.00 for children aged 14 years and under.